Stage Center Theatre is located in Building F, next to Lech Walesa Hall. Stage Center Theatre pulls back the curtain on how it serves NEIU students. Each season, Stage Center produces four main shows: two Children’s Theatre Workshop productions and one Nuevas Voces ten-minute play festivals where students have the opportunity to showcase their talents. “Stage Center Theatre is the name of both our physical theatre space on campus and the broader theatre program,” Dr. Shayne Pepper said in an email to the Independent. Stage Center Theatre is managed by the Communication, Media and Theatre (CMT) department. Pepper is an associate professor and chair of the CMT department. Main stage shows are extracurricular opportunities for students and shows for young audiences are produced through the credit course,“Children’s Theatre Workshop” at NEIU. Nuevas Voces is a playwriting contest and festival which is open to students and community members. The winning plays are performed at Stage Center Theatre. Though Pepper is responsible for providing departmental support, Nuevas Voces is run by Sarah J. Fabian, assistant professor and managing artistic director for Stage Center Theatre. “[Sarah] has so much experience and knowledge,” Catherine Perez said, a senior at NEIU and an active participant at Stage Center Theatre. Perez is designing the set for the upcoming Stage Center Theatre production of “Antigone”. Scenic design and technology is Fabian’s specialty, which is just one of the many roles that are necessary to theatre production. “There’s tons of opportunities behind the scenes, myself being a person who does not like being onstage in the limelight,” Fabian said. In addition to performing onstage, participants can become scenic designers, builders, carpenters, painters, costume designers, makeup designers, assistant directors, stage managers, lightboard and soundboard operators, and crew members. “We prefer to have our shows be as student-staffed as possible, therefore we’re giving the Northeastern students all of the opportunities that are available to them,” Fabian said. However, students do not have to be majoring in CMT to gain skills and experience through Stage Center Theatre. All students, even NEIU faculty, are welcomed and encouraged to participate in Stage Center Theatre productions. 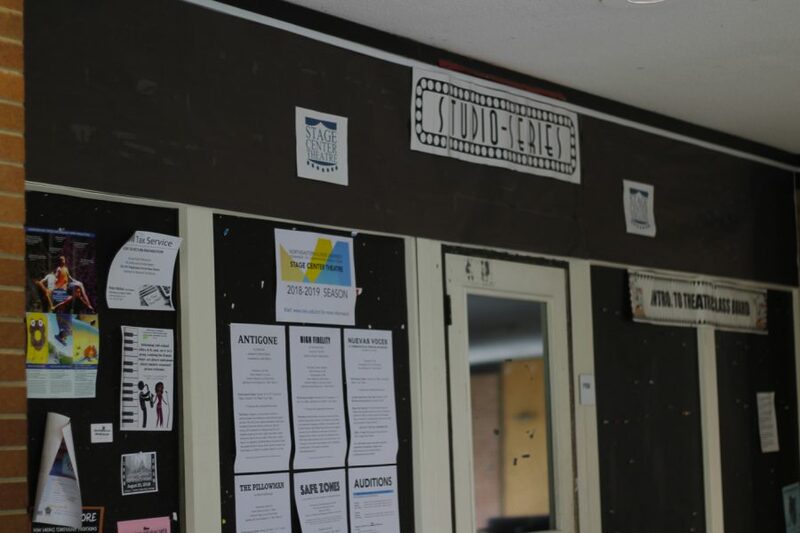 “We have students within CMT who participate because they have an interest in theatre, but we also have people across the campus who…[are] not theatre majors,” Fabian said. Fabian and other instructors also allow students to explore different theatrical roles and responsibilities at Stage Center Theatre. “We do try to rotate you through different areas so that you get some exposure to different departments. Because maybe you never touched a lighboard before because you’ve always been a carpenter, but then suddenly you fall in love with a whole new area,” Fabian said. Fabian’s sentiments ring true for Perez. The NEIU senior is majoring in CMT but only recently discovered her love for the performing arts. “I didn’t know that I liked theatre until I actually started getting involved,” Perez said. Perez now hopes to incorporate theatre into her career goal: forming a nonprofit organization to benefit minorities and underrepresented groups, such as undocumented individuals. “It would be really cool to be able to fundraise with shows…and have people participate and tell stories through that,” Perez said. Even if students do not pursue theatre after graduation, Fabian explains that skills learned through theatre participation apply to other professions. “You’re learning all of these problem-solving skills, collaboration skills, working with lots of different people…you’re learning critical thinking skills as well,” she said. While Perez and Fabian both expressed the need for more funding and support, ideally in the form of a new theatre building, changes are coming to Stage Center Theatre. These additions include a revolving stage, a dedicated space for costume design, and ASL interpretation for performances. Stage Center Theatre also strives for diversity in selecting and staffing their productions, and is working on creating a platform for students to provide feedback and suggestions regarding productions. “We have to put the students first,” Fabian said. Fabian and the rest of the Stage Center Theatre staff seem to be doing just that, according to Perez’s testimony. “Sarah has been a big part in why I love theatre and why I got encouraged to continue…it’s been really cool to get to know her, and her work ethic and her vision behind theatre is really cool,” Perez said. “Theatre is where I landed what I really like to do,” Perez said.